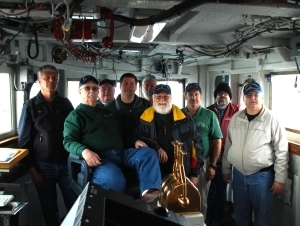 The CCECPSCO under agreement with the Icebreaker Mackinaw Maritime Museum Ship organization to establish and operate a Ham Radio station from the area of the chart and crypto rooms just aft of the pilothouse, to assist with maintenance and updates to electrical, electronic, and navigation systems, and to help promote the ship through our activities. Station is staffed every other weekend throughout the season. 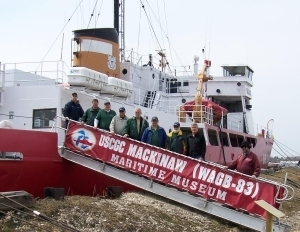 Those who have made contact with the Icebreaker Mackinaw W8AGB, including during Museum Ships Weekend, or with other CCECPSCO operations using the W8CCE call may request a QSL card by sending an SASE along with your QSL card for the contact to the following address. 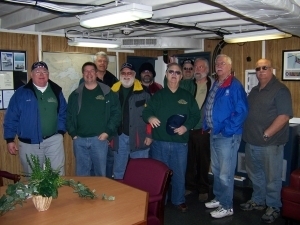 From left to right: John Wilcox KC8OAZ, Bill Dunstan KD8CNS, Chuck Brew N8NXP, Rick Jersey KC8TU, Bob Still KD8CYQ, Chuck Scott N8DNX, Tom Swiger WA8AA, Ralph Mueller WB8TBL, Mike Cleary W8VPC. Note the ship's designation WAGB-83. Suprisingly, the call letters W8AGB became available a bit ago and we were able to secure that as a vanity call for use on the ship. 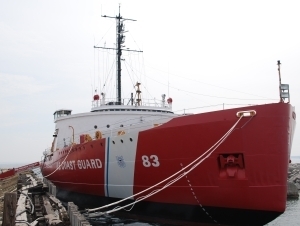 If you hear W8AGB on the air, it will be from the Icebreaker Mackinaw, so give us a call! Bill Dunstan KD8CNS looks on as Rick Jersey KC8TU works on restoring power distribution to the various equipment above the chart table in the Chart Room. The Chart Room is located just aft of the Wheelhouse. The next room aft of the Chart Room is the Crypto and Radio Room which is where the RT-9000's, the W8AGB VHF and UHF repeaters, DC supplies and power distribution for much of the ships communications and navigation equipment, and other equipment are being installed and restored. 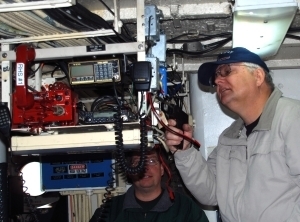 Bill Dunstan KD8CNS, sitting at what will become the W8AGB main operating position, is shown testing one of the two Sunair RT-9000 HF radios that belong to the ship. 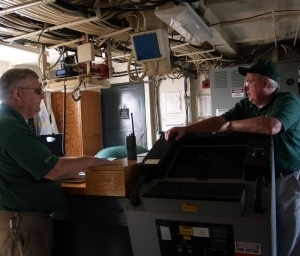 One of these very robust 125 Watt HF radios was connected to the ship's crypto equipment and the other was for voice communications. 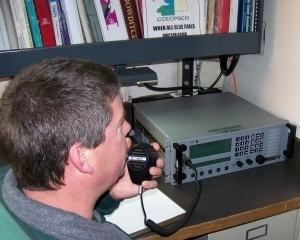 The CCECPSCO is looking for at least one of the RCU-9310 remote control panels and a pair of Sunair F-9800 Pre/Post Selectors to permit full use of these radios. Both radios were originally connected to 125 Watt antenna couplers and vertical antennas. The CCECPSCO has restored operation of one coupler and antenna and is hoping to complete the second this summer. Equipment for the radar Chuck is leaning on has been removed from the ship. 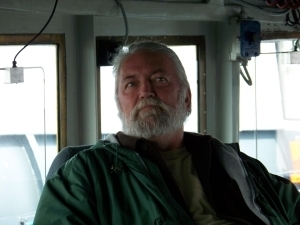 Other smaller radar and much of the ships communications and navigation equipment is still on-board. CCECPSCO members are assisting the museum with restoration and operation of the those systems. The CCECPSCO is also researching communications equipment that had been used on the ship in years past and will be working to acquire and restore examples of that equipment. It's hard to see in this image, but there's a 160-40 Meter Dipole swung from the end of the Starboard end of the lower horizontal arm. Also at each of the spot-lights on the upper deck are the antenna couplers and vertical antennas linked to the two Sunair RT-9000 transceivers. Additional antennas planned for this year are VHF and UHF repeater antennas at the top of the mast and a KC8TU customized wire antenna for the Port side.